Online holiday shopping is big business. Last year in the U.S., Americans spent $56.43 billion shopping for the holidays via their desktop computers. And $2.3 billion was spent online on Cyber Monday alone, making it the biggest online shopping day ever, according to a statista.com survey. If you plan on shopping online for jewelry this holiday, here are some important things to know and do so you can “Buy Now” with confidence, courtesy of the GIA (Gemological Institute of America). Clearly, there are myriad reasons to shop at home on our computer, or on-the-go on our tablet or smartphone. Certainly, the convenience of being able to buy wherever and whenever we want is appealing. Also, shopping online eliminates the pain of driving in traffic, wading through crowded stores, and waiting on long lines for sale items that may or may not be sold out. Another big benefit is the research aspect of online buying. Whatever type of jewelry you’re looking to buy, from vintage estate jewelry to high-end diamonds and luxury watches, you can research the online vendor via third-party reviews and consumer feedback. On many online jewelry shops and consumer review websites, you can find comments from customers who’ve bought products from that shop. This is a great way to find out what kind of experiences people had, and if there are any trends in either a positive or negative direction. Also, like most websites, online jewelry shops have a “contact us” section, where you can ask questions about the products available, and specifics such as colors, sizes, grading, availability, shipping, payments and other purchase details. Here’s some GIA advice on buying jewelry online. As with any significant purchase, start by researching your specifics about the piece you want to buy, such as how the price is determined and variations in quality. With diamonds, for example, understanding the 4Cs—Carat, Color, Clarity and Cut will help you understand the variations in price and quality. The more you know about what you want, the better deal you’ll be able to find. Also make sure the website you are considering purchasing from is reputable—more on that below. One downside to buying online is that you can’t see the piece you are buying up close, in your hands. Still, there are ways to confirm if a piece is authentic or not, starting with shopping at reputable websites. Buying signed jewelry is one way to ensure you are purchasing a high-quality item — as long as it is the real thing. Genuine signed jewelry is any piece of jewelry stamped by the company that makes it, such as Tiffany & Co., David Yurman, Cartier, Harry Winston, etc. Signed jewelry pieces are almost always made from precious metals and genuine gemstones. That is the main reason they are more expensive than non-signed pieces — you’re paying for higher quality materials and craftsmanship. Conversely, most replica jewelry pieces are made of non-precious metals and synthetic stones because it is much cheaper to produce and they are usually made in mass quantities. So, when looking to buy a signed piece — especially if it is pre-owned — make sure that it is made of the exact same metals and stones that the designer uses for that specific line or design. Here are a few things to check regarding the seller, before you buy. Does it belong to any jewelry trade associations, such as the GIA? How will the jewelry be shipped? 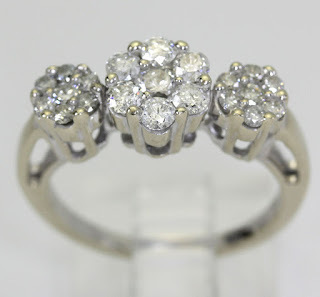 In addition to the above, if you’re buying from online auction sites, you’ll also want to look into buyer feedback and ratings and determine if the seller is providing sufficient evidence of the quality of the jewelry offered for sale, such as photographs, a grading report, or report number that can be verified. For example, U.S.-based consumers have options for recourse when buying from a U.S.-based company, such as filing complaints with the Federal Trade Commission (FTC), Jewelers’ Vigilance Committee (JVC), Better Business Bureau (BBB), etc., or pursuing a legal case in civil court. Websites that do not have a physical presence in your home country may be insulated from recourse and attempts to recover funds can be frustrating. Finally, remember that choosing the right piece of jewelry for yourself or others is also subjective: Don’t just focus on the price or rating —go with what looks beautiful to you and is in your budget. If you’re buying for someone else, apply the same logic. Know his or her tastes. Does he or she prefer size over quality, or quality over size? If he or she prefers size and quality, you may need to do some real comparative shopping! Also, make sure you know the person’s ring size, as well as the jewelry store’s return policy.